Three-dimensional (3D) printing of small objects at home has become a popular hobby for wannabe designers, and this shows also in the new technology “hype” statistics. Anything from decorative and hard-to-find spare parts to the constituent parts of the printer itself can be manufactured using mesh designs and an export file for the printer in question. Second Life © (SL) is also a viable platform for viewing the designs before printing them in 3D, and now also designs made for SL can be printed in glorious 3D for real-life (RL) use. Stareyes Galaxy discussed the technology and real-life examples of SL jewelry with Joja Dhara and Maxi Gossamer. SLE: So, the development is going toward where avatars can take their designs and print them for real life, at their home, instead of having someone to do it for you? JoJa: Yes, indeed, and the fun part can also be that you both work on an item. I love for instance the open-source Pixelviewer that has the ability to print out your object that you created in-world. SLE: How do you think the current offering of home/hobbyist 3-D printers can do this for you? JoJa: With some interesting open source 3D programs like Sketchup and Blender, it makes [this] possible. So yes, it is interesting to have a 3D hobbyist printer. SLE: Home-grade printers have some problems with regard to the filament getting all over the place, filament supply cutting off at the wrong spot etc. Do you experience these problems as an obstacle? JoJa: In case of material instability... I think we all are pioneers in this whole 3D web environment... Yes, there are still some down things like material leaking etc., but as we are so known to ‘xyz’ we quickly can adjust. SLE: If you are eager to get a design of yours printed as a 3-D object, what should you do? SLE: So, you need to be a mesh-qualified designer in SL (easy quiz) and have the software tool to convert the design to code for the printer. JoJa: To bring it in so far as I know you need to know about how to import it inworld... so yes. SLE: Where do you see is the greatest demand for 3-D printing, currently? JoJa: Prostheses, jewelry business... prototyping of architecture... food printing... and as said broken things... handles, buttons, beside all the great creativity in art... but also in printing out the printer itself! SLE: Yes, I have often wondered - are we entering the era of self-replicating machines? JoJa: We work at the FabLab with a 3d printer that most parts are printed out by the printer... Felixprinter. Exactly! SLE: I know that all of these open-source printers have their own web forums. Would it be a stretch to expect to see some of that activity here on SL? JoJa: Thingiverse is one of them .. I dearly hope so. SLE: Technically - what are the size limits in 3-D printing? JoJa: Of the hobby ones, I would say 20 cm cubed. SLE: So, no printing a house to live in. JoJa: No you need bigger printer for [that] - but you can do brick by brick. SLE: Is the 3-D printing of objects expensive, in RL terms? JoJa: No, you really can take a lot out of filament of let’s say 1kg, only it is a matter of mass and time. Maxi Gossamer, the well-known jewelry and accessory designer joined us, and we paid a visit to her in-world store “Gossamer Jewellery” as well. SLE: Maxi, maybe you could tell me about how you came about the idea of taking your SL jewelry to the real world, in the first instance? 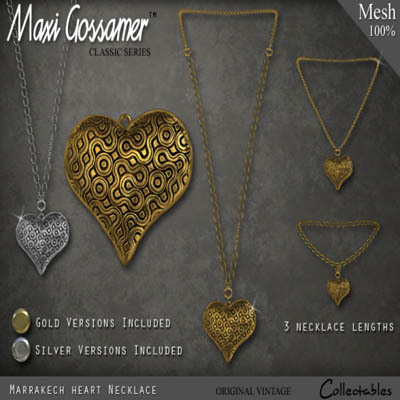 Maxi: Well, I was making SL jewelry and found Shapeways while browsing one day and I was totally amazed that I could get my SL jewelry printed out in RL. In fact, I was stunned this was possible. 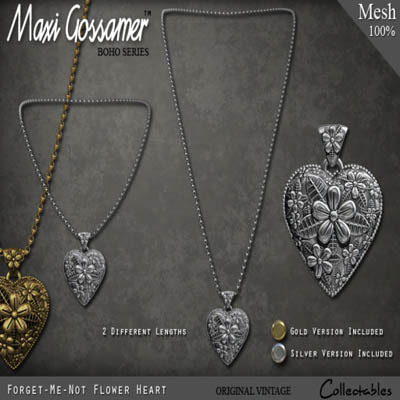 I didn’t know it was possible to print in silver and other metals until I found Shapeways, and I saw all the other creators at Shapeways printing all sorts of things - jewelry, lampshades, toys, etc. and I thought, I just have to have a go at that! In fact I'm now thinking about opening a website to sell my silver RL jewellery collections. Shapeways make it very easy to get your designs printed. SLE: For a designer, what is required of you to make that happen? Maxi: There are a few special rules you have to stick to like thickness of metals so things don't snap. Also I'm learning that on bigger pieces, if you're printing in silver or metal you really need to make them hollow so you don't use too much silver so the pieces are cost effective and affordable. SLE: But those rules would apply to any RL jewelry? 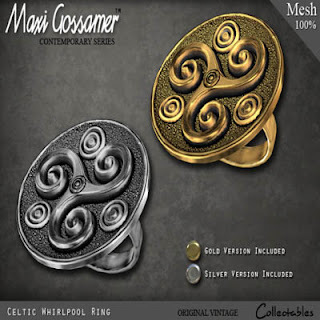 Maxi: Yes that's true, although I think you can make jewelry with 3D printing that would be very difficult to do using traditional wax carving method or you would have to be a master carver and jeweler to do it. I can do things in 3D that I could never make in RL for RL jewelry by carving wax blocks, but with mesh I can be clever and look like I'm a master carver and jeweler - but I'm not really. SLE: Do you know of other services besides Shapeways who can do this? Maxi: Yes, iMaterialise.com also print 3D files. They also print in gold. iMaterialise were more expensive than Shapeways so for the moment Shapeways are my first stop. SLE: What materials are available to you from Shapeways? 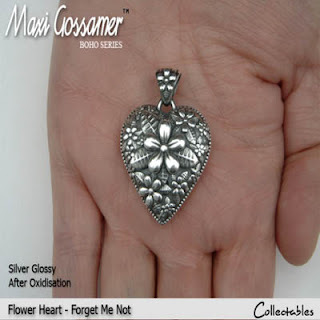 Maxi: Silver is my preferred metal as it gives the most details when it's cast. But Shapeways also do stainless steel and bronze which can look nice for less detailed pieces, but they are slightly grainy in effect. You can also print all kinds of plastics and ceramics at Shapeways too. The file I send to Shapeways is used to print the wax cast for the Lost Wax method, which has been used for thousands of years to cast metals. There is another way to print gold and silver called laser sintering. Totally amazing process, like science fiction, where you can print directly in gold and silver, no wax cast needed - really expensive right now though. Direct printing in precious metals is the Holy Grail I think. Maxi: I have thought about buying in jewels, getting the setting 3D printed and then putting the jewels myself, but that's a second phase for me, I need to learn more before I do that. JoJa: It’s so great to see you Maxi get into the real life jewelry making. I had just a jewerly maker real life getting into the 3D making... would be fun if they would then enter these 3D worlds to present it here... circle go round. Maxi: Yes, JoJa the crossover is wonderful and great fun. SLE: Are there any final remarks you might want to make about bringing SL designs into RL? Maxi: Amazing things are going to happen with this technology. This is just the beginning and the future is full of potential. 3D printing is going to enable artists of all kind, virtual and otherwise, do wondrous and beautiful things. Human beings are tool makers and we now have at our fingertips the most amazing tools to help us make things. A new age of making is dawning. I do love this technology, it frees us artist types. JoJa: Amen to that! As I say if more will start to design for 3D printing they will come across the same tools and might understand more what virtual worlds / 3D web is about. The physical reality of Second Life objects is closer than we think, with the emergence of the 3D printing industry. 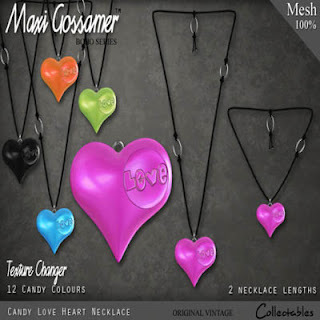 Maxi Gossamer and Shapeways are a prime example of the pioneering work. As JoJa Dhara pointed out, there is a lot of utility printing already happening with real-life designs – I am hopeful that also the fantasy elements of SL will be brought to life with this technology. Printing things that I made in SL would be amazing! Almost like a RL-SL bridge in which I can hold my beloved SL objects in my hand!